It always surprises, but I guess it shouldn’t, just how many people and businesses are devoted to providing free signals. For the most part they are all involved in affiliate marketing, not all, but most. Brokersignals.com is not an exception. This is a supposedly “Free” signal service provider, or SSP, offering signals for super short term binary options trading. Anyone who knows me will also know that I don’t put much faith in super short term trading (options with an hour or less until expiry). The markets are just too unpredictable at that time frame, no one can really guarantee long term success trading it. The thing about this website is that it makes claims to the effect that it is not in fact an SSP with one sentence and then goes on to offer its free packages and paid services. What does Brokersignals.com have to offer us? The information provided on the website under the Trading Signals tab is a little confusing. They start off telling you how they are not like the usual run of the mill SSP. 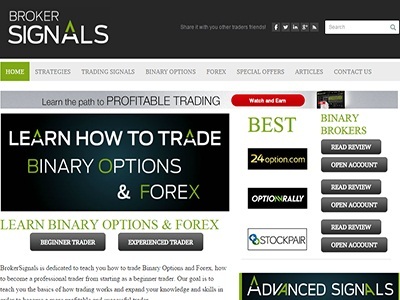 Brokersignals.com is different because it is a guide for traders that explains strategies for trading forex and binary options. Right in the next paragraph they switch to the offer of a “free” package or the paid service. They claim an impressive 85%-90% win ratio which would be enough to attract any trader if it were true. Whether or not it is will be discussed later. In order to get the free package you have to open an account and deposit money with their recommended broker, bam, affiliate marketer. They even tell you to delete your cookies so they can be sure that the account you open is tracked back to them. I don’t mind the SSP’s making money, every one needs to eat. I just prefer for them to be straight up about what their motives are when attracting new customers. Some one without the experience in the industry that I and many of you have could easily get sucked into trading super short term binary options through one of these websites. At least this one offers the choice of signing up or buying the services early in the pitch, I hate it when I start to think a website it on the up and up only to find out at the last minute you have to join up with through one of their brokers. One of the good things I found on this website is that it recommends good brokers. All too often one of these SSP’s is really being run by a shady broker using it to generate traffic for it’s super risky 60 second options. The top four brokers recommended are 24Options, Lbinary, Stockpair and Banc de Binary which are all reputable brokers. One of the negatives is that this website is advocating you accept bonuses, free gifts and other enticements offered by the brokers. This is not good. Any gift or bonus given by a binary option broker is meant to keep you money in their accounts and force you to trade. All bonuses come with a trading minimum in the range of 15 to 50 times the account value plus the bonus. This means that you have to execute trades in the that amount or more before you can withdraw any money, including your own. Sometimes the bonuses also come with a time limit because the brokers know that if they can make you trade more they have a better chance of you losing all your money. Another negative is that this website does not seem to offer the very information it is using to lure in traders. The claims of being a resource for traders is a smoke screen. There are many links to articles and blog post on the web site but none of them go to any articles, just more marketing. I did find one page that seemed to have articles but it was just short one paragraph excerpts with no links to the real deal. In fact, what I read in these little excerpts has led me to believe whoever wrote it does not even no how to trade binary options because one of the strategies is to buy “deep in the money options”, duh… you can’t buy a deep in the money binary option because it is a spot position, the price at time of purchase is the strike price making any option you by automatically AT THE MONEY. Maybe they are confusing Nadex options or some other form of 0-100 style binary options with the spot binary brokers they are recommending. I think this website is a smoke screen. It offers a lot in the way of services for traders but there just isn’t any meat on the bone. The whole thing looks like it is nothing more than an elaborate marketing page geared to drive traders to either buy the services or sign up with a broker. Since we can’t be sure of their success and since cherry picking the signals they provide adds enormous risk to trading I can’t recommend anyone to use this service at this time. Not to mention I am still not sure if these people even know how to trade binary.